- providing the reader with quality information edited by a Doctor of Neuropsychology. - how to keep the brain fit throughout the lifespan. You might have heard of Mnemonics and how they can help you improve your memory. Continue reading "Mnemonics - Remember In Quick and Easy Steps"
Memorize using motion. The human brain easily absorbs information, stories, names and faces that easily catch its attention. Continue reading "Memorize Using Motion "
Physical activity and fitness benefits brain health. But what happens when you stop exercising? Continue reading "Physical Activity and Fitness Improves Brain Health"
Memory loss facts are edited and researched by a neuropsychologist to help you find the answers to your memory loss questions. We are eager to help you improve your memory health and life! Continue reading "MEMORY LOSS - FACTS AND FITNESS NEWS"
Sleep medication and falls have been in the news since medication for sleep problems is often prescribed for patients in the hospital. Continue reading "Sleep Medication and Falls"
Continue reading "Ways to Boost Your Memory"
Ways to improve your memory has been in the news. Here are some great tips. Continue reading "Ways to Improve Your Memory"
How to get a good memory is in the news. Even the most organized and collected individuals have found themselves drawing a blank at some point. Continue reading "How to Get a Good Memory"
Continue reading "Military TBI: Scope of the Problem"
Forgetful? 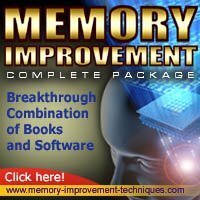 You want to find out all that you can about how to improve your memory and you need to do it as quickly and efficiently as possible. Continue reading "Forgetful: Great Tips And Advice "
Memory Improvement: Give Your Mind A Boost! Memory improvement is vital. Even the most organized and collected individuals have found themselves drawing a blank at some point or another when called upon to recite a key piece of information. Continue reading "Memory Improvement: Give Your Mind A Boost!" Does Exercise Prevent Brain Shrinkage? Brain Atrophy or brain shrinkage is on the minds of many. As the number of baby boomers continues to mount, the notion of losing brain functioning and brain cells is on the minds of millions. Continue reading "Does Exercise Prevent Brain Shrinkage?" Memory foods are an issue that concerns many people as they age and their memory comes more into focus. Continue reading "Memory Foods: What Helps Reduce Risk of Memory Loss?" Search for memory loss facts. Continue reading "Memory Loss Facts Site Search"